The BYU Religious Studies Center has recently published a new book that will surely be helpful to anyone interested in understanding Isaiah in the Book of Mormon. 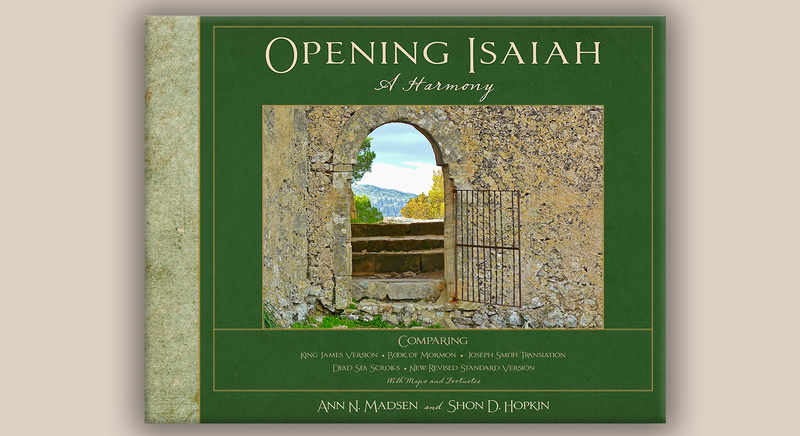 Ann Madsen and Shon Hopkin’s new book, Opening Isaiah: A Harmony lays out five different versions of the book of Isaiah in parallel columns, allowing the reader to compare each version: (1) the King James Version, (2) the Joseph Smith Translation, (3) the Book of Mormon, (4) the Dead Sea Scrolls, and (5) the NRSV. The authors have painstakingly formatted the five versions of the text so that all the verses line up perfectly, making it easy to see the similarities and differences in each verse. In addition, the Joseph Smith Translation, Book of Mormon, and Dead Sea Scrolls versions use italics, bold text, and strikethroughs, allowing the reader to instantly see how each version differs from the King James Version and from each other. One especially useful feature for people interested in Isaiah in the Book of Mormon is the inclusion of both the longer chapter-length Isaiah quotations, found in 1 and 2 Nephi, Mosiah, and 3 Nephi, as well as many of the shorter verse-long quotations scattered throughout the Book of Mormon. The book also includes many useful maps that help to clarify the sometimes-confusing geography Isaiah refers to. The many footnotes help to explain more about the historical context of Isaiah’s words. The introduction to Isaiah and his writing style, near the end of the introduction, helps to make Isaiah less intimidating and easier to read. Opening Isaiah can help even the most inexperienced reader of the great prophet understand the various versions of Isaiah better. Even more important for readers of the Book of Mormon, it can help to make reading the “Isaiah chapters” a more enriching, and less confusing, experience.